After a preliminary meeting on 27 April 1975 at Peter and Jocelyn Brouwer's home the Taranaki Mustang Club was officially launched on 11 May 1975 at Barry and Mary Corbett's farm. 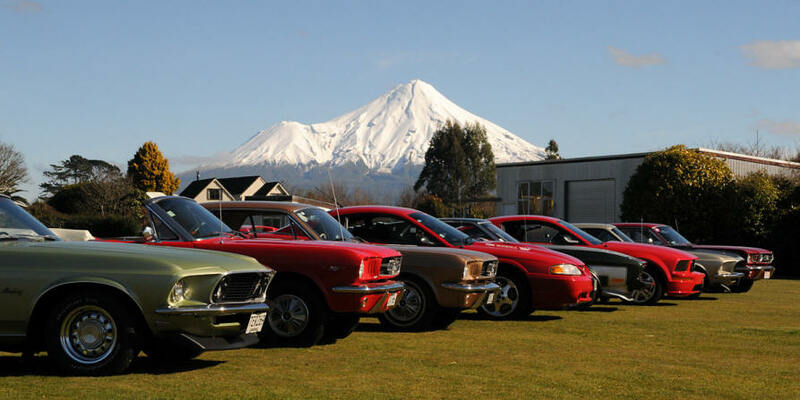 This makes it the oldest NZ Mustang club. When formed there were 6 Mustangs in the club. The club lapsed after Xmas 1976, but was reformed with new vigour on 11 June 1977 with 12 members. The club is proud to have Lee Iacoca (the creator of the Mustang) as its honorary patron. Today the club has about 60 members from all over the Taranaki Region. Five track only cars, including one with over 650 bhp. Club meetings are held monthly and alternate between New Plymouth, Central Taranaki or Hawera. The club magazine is called Mustang Roundup, and is published every 3-4 months. The club also elects an historian, overseas correspondent and official photographer for club events. 66 Shelby GT 350 at New Plymouth airport, with Tom Cruise's almost as cool personal jet.